Performance on a Budget from a Brand you can trust. The MaxiMist Lite Plus HVLP Spray Tan Machine is the perfect unit for home use, the budget conscious mobile tech or salon startup. A powerful Single Stage Turbine and a German engineered Spray Gun with a spray nozzle that is designed to provide maximum atomization of Spray Tanning Solutions with the least amount of over spray possible. German engineering at its best! 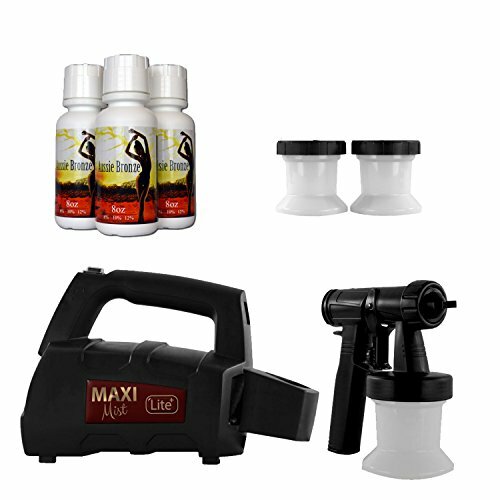 The MaxiMist Lite Plus Spray Gun is super simple to use, extremely lightweight and incorporates a non-stick needle that virtually eliminates tanning solution buildup and corrosion which lead to clogs. Simple adjustments at the trigger allow you to control the spray flow and will apply any tanning solution with flawless precision. The MaxiMist Lite Plus also includes our specially designed cups which feature a conical solution reservoir for optimum pick-up. This design forces all solution in the cup to the center allowing a more flexible range of movement while spraying. With an extra wide base for improved stability. OVER 10,000 SOLD ! - Home/Mobile/Backup unit for 10 plus applications a day. • Very Beginner Friendly • on board gun storage • Lightweight Mobile design. If you have any questions about this product by MaxiMist, contact us by completing and submitting the form below. If you are looking for a specif part number, please include it with your message.